As a great fans of football (specially of the World Cup finals), we decided to create a quick and free project in order to pay tribute to the world cup football, as a maximum exponent of the football. The idea was make a journey across all the 20 editions, from 1930 to 2014, including a resume, photos, videos, and interesting facts about each edition. As a quick project created without any commercial purpose, one of the objectives was spend the less money possible (ideally, only to buy the domain). That means all the photographical material must be free of copyrights, and the work in terms of research to find accurate and proper material had to be massive. The objective was be enough flexible and "creative" to reach the matching between significance representation of any World Cup and the availability of graphic material without rights. As an example, "Mexico 86" clearly must be represented by mention of Diego Maradona, but unfortunately all the material was copywrited. The solution was to use a non-copyrighted photography of a graffiti of Maradona in the city of Napoli, representing a classical and iconic 1986 image, in order to show how important was Maradona for Argentina in World Cup held in Mexico. Due the nature of the project, instead an exhaustive guide full of data, the purpose was create a short and quick resume of any World Cup, in a very visual and enjoyable way. For that reason, a very clear interface, where user should navigate easily across the years or even go directly to a specific year was necessary, and an elegant visual style would fit perfectly to this "glamorous" theme. So, when user reach the desired World Cup year, a big and beautiful photo is shown, with a very short description. Next, a resume of the championship below, along flag with the winner and the current wins for this country in this year. Finally, two sections more: “Did you know?” and the “Video Theatre”; first is a recap of fun and/or interesting facts related to the specific World Cup, and the second is a selection of relevant videos for one or other reason, embedded from Youtube. 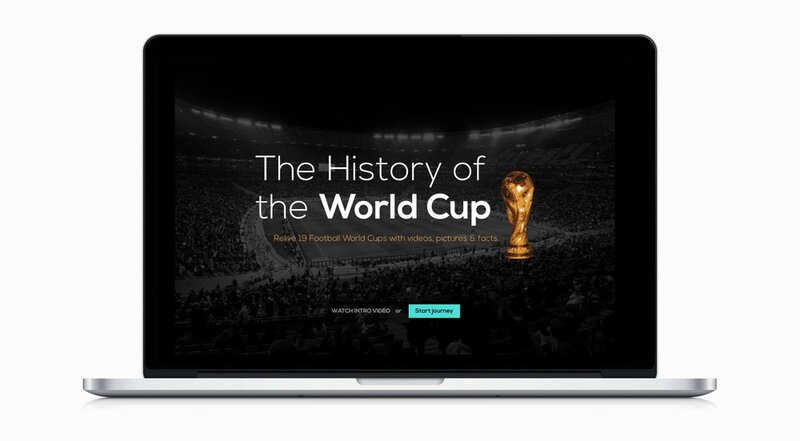 The History of World Cup is created in English and in Spanish.